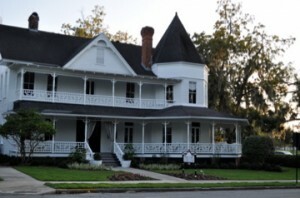 There is an old mansion now the home of the Muse Cafe and other little shops that is on the corner of Fort King Street and Watulla in Ocala,Florida. The old mansion is a Queen Anne style Victorian built about 1888 or so by John F. Dunn..a lawyer..a banker..a former Mayor of Ocala.He founded Dunellon and co founded Belleview (both in Florida) and did a lot of charity work as well as a lot of investing in phosphate mining and other ventures as well. I have been in this home many times and I have been told by wait staff that an apparition of a young beautiful woman dressed in Victorian period clothing walks up and down the stairs of the old grand staircase in the center of this stately home.The ghostly woman also has been seen around the three former bedrooms upstairs (now shops). A couple of houses down the same street the old Seven Sisters Inn which was a bed and breakfast is also reputed to be haunted and urban myth says a murder was committed there around the late 19th century by a jealous lover (male). John F. Dunn died in 1897 of a heart attack. John F. Dunn actually died in 1893 (not 1897) of Bright's disease, a disease of the kidneys, not heart failure. I would love to see his home someday.